Ratings and rotors continue to grow as the offshore sector goes global. The latest incremental upgrade of the Siemens Gamesa direct-drive platform provides a nameplate capacity of 8MW with a power mode option up to 9MW, and an enlarged 167-metre rotor. Visual differences over the current models include a safety-enhancing backward-mounted helicopter-hoisting platform and a nacelle cooler upgrade that allows easier upkeep. The nacelle and generator main structure and dimensions are largely unchanged, and a 66kV MV-transformer is a semi-standard fitting. The power-mode option offers optimised LCOE through increasing AEP under specific operating conditions. The 8.0-167 has load-based individual pitch control (IPC), aimed at minimising rotor and turbine loads. Main components have been left unchanged whenever feasible. The mass of the B82 blade is only a little up on its B75 predecessor, despite not using carbon and being 6.5 etres longer. The generator from the now discontinued SG 8.0-154 DD turbine has been re-used, with some cooling enhancements, and operates within the same rated speed range. But the longer blades running with a similar rotor speed result in an 8.5% increase in tip speed. This could potentially lead to accelerated leading-edge erosion and premature degradation-related failures, but this is counteracted by integrating a new protection polyurethane layer within the leading-edge composite. 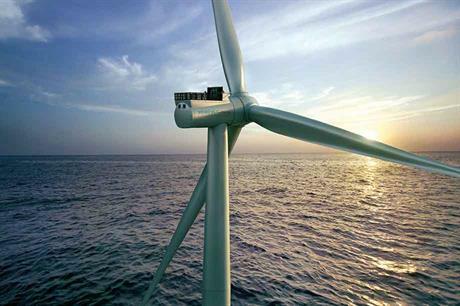 The highest-rated offshore turbine combines state-of-the-art wind technology with innovative features. The V164-9.5MW enjoys substantial developer interest and a 385-unit order intake. The model has retained a tube-shaped medium-speed drivetrain with flanged connections from earlier V164 incarnations. The load-carrying main shaft housing is the only main drivetrain component structurally attached to the cast main chassis, integrated with a mass-optimised lattice-steel rear structure. The design modifications left the turbine’s main dimensions unchanged. Gearbox strengthening to cater for the 19% increase in rated input torque was achieved without impacting drivetrain dimensions and mass. The electrical system, the rooftop cooler for the gearbox, generator, hydraulics and rectifier were also upgraded without enlarging the cooler size. The direct-drive SG 7.0-154 is an evolution of the 6MW model, also fitted with a 154-metre rotor and introduced in 2012. Both versions incorporate a novel in-house outer-rotor PMG, while the spacious cylindrical-shaped nacelle offers easy internal service-hub access via a hollow generator shaft and single rotor bearing. Two individual power-electronic converters are sited inside the nacelle, and, on the 7MW model, a 33kV or 66kV medium-voltage transformer is located in a separate compartment underneath and behind the tower. Head mass is a favourable 360 tonnes. Although it will be superceded by the SG-167 turbine in 2020, the 7.0-154 model has a huge order backlog and an advanced mature supply chain.